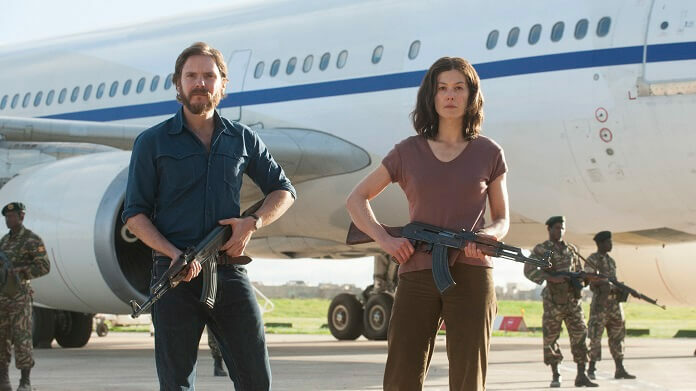 Focus Features has just released the official trailer for the dramatic film, 7 Days in Entebbe. The thriller’s based on a true story and is directed by José Padilha (Narcos, Elite Squad: The Enemy Within, Robocop) from a script by Gregory Burke (’71). The studio’s planning a March 16, 2018 theatrical release. The cast of 7 Days in Entebbe includes Rosamund Pike (Hostiles, Gone Girl), Daniel Brühl (Captain America: Civil War, The Alienist), Eddie Marsan (Jonathan Strange & Mr. Norrell, Mark Felt: The Man Who Brought Down the White House), Ben Schnetzer (Warcraft: The Beginning, Happy Town), Lior Ashkenazi (Good Family, Foxtrot), and Denis Ménochet (Assassin’s Creed, Spotless). Working Title’s Tim Bevan and Eric Fellner produced along with Kate Solomon, Ron Halpern, and Michelle Wright. Jo Burn, Liza Chasin, Olivier Courson, Jean-Claude Darmon, Jonathan King, Angela Morrison, and Jeff Skoll served as executive producers. 7 Days in Entebbe is rated PG-13 for violence, some thematic material, drug use, smoking and brief strong language. The Plot: A gripping political thriller inspired by the true events of the 1976 hijacking of an Air France flight en route from Tel Aviv to Paris, the film depicts the most daring rescue mission ever attempted. 7 Days In Entebbe brings the longstanding conflict between Israel and Palestine into focus by recounting the heroic military mission while also exploring the nuanced perspectives of both sides.